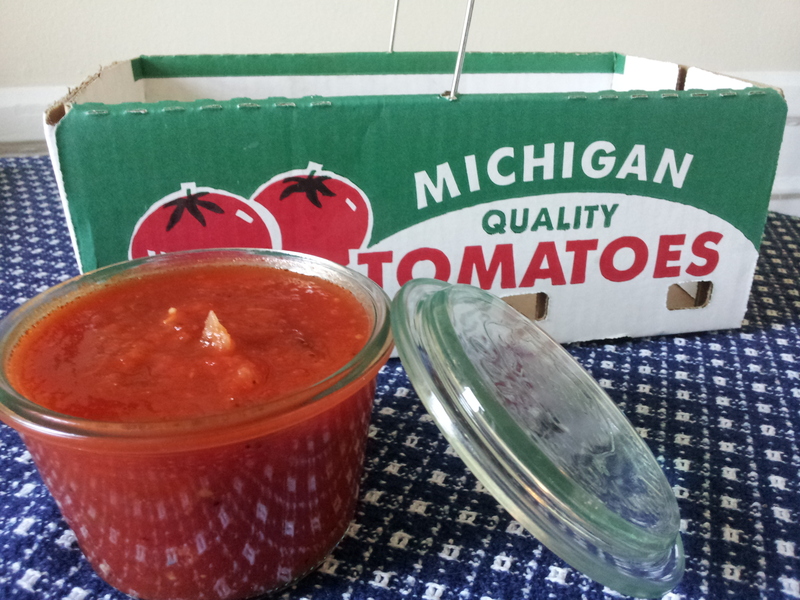 This is the perfect time of the year to share my fresh homemade tomato sauce. Tomatoes are in abundance at the farmers markets, and they’re at their peak of freshness. This is definitely a summer tomato sauce. Light, extremely flavorful, and oh so fresh tasting. 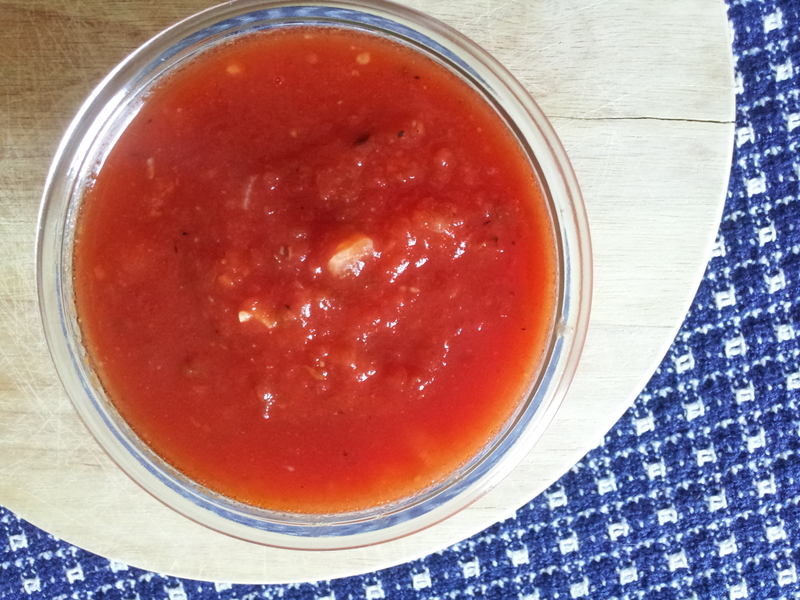 This sauce will ruin all other tomato sauces for you (sorry). My favorite way to serve this sauce is over warm pasta with grated parmesan cheese and plenty of fresh basil. If you prefer meat sauce, add to browned Italian sausage or pancetta. If you want to up your vegetable intake, combine sauce with roasted zucchini, mushrooms, and red peppers. Use in any recipe that calls for your favorite marinara sauce, or simply tear off a piece of fresh bread, dip, eat, and repeat. The opportunities are endless. Make it soon, before tomatoes say goodbye to us for the winter! First, you need to blanche and peel your tomatoes. Bring a large pot of water to a boil and prepare an ice water bath in a large bowl (just like it sounds…add ice and water in a bowl large enough to hold all of your tomatoes). Cut a small x into the bottom of each tomato. Place the tomatoes in boiling water and blanche for 15-30 seconds. Immediately place blanched tomatoes into your prepared ice water bath to stop the cooking process. Your tomatoes are now ready to peel. The skins should easily come off, but if you are having a hard time, just add the trouble tomato back into the boiling water for 10 seconds. Discard the skins. Next, you will need to remove the tomato seeds. Cut tomatoes into quarters or in half. Squeeze tomatoes over a strainer placed over a bowl to catch the juices. Discard the seeds and reserve the tomato juice. Note: If you live in a region where fresh tomatoes are not prevalent, use canned whole tomatoes in their juice (2 28oz cans should do the trick). Just disregard the first 2 steps and skip straight below. Place prepared tomatoes into a food processor or blender and pulse until a puree is formed. If you prefer a chunkier tomato sauce, mash tomatoes with a potato masher. Add reserved tomato juice to tomato puree and reserve. To prepare your sauce, add olive oil to a pot over medium heat. Add onions and garlic and cook for 5 minutes until translucent. Add reserved tomatoes, oregano, salt, pepper, red pepper flakes, and bay leaf. Let sauce come to a boil, then reduce heat and allow sauce to simmer for 45 minutes, stirring frequently. Remove and discard bay leaf, and add fresh basil. Adjust seasoning to suit your taste and enjoy! This will result in a light, fresh, summer tomato sauce. If you prefer a more caramelized sauce, allow to cook for an additional 30-45 minutes. Yields: 3 1/2 – 4 cups. This recipe is ideal for canning or freezing.